Opposition to Lucky Minerals Inc. remains strong, in spite of the company’s attempts to ingratiate themselves to locals in the Paradise Valley. According to the Bozeman Daily Chronicle, the company is “working on its image,” setting up a Facebook page and sending people to Bozeman and Livingston to canvas in favor of the company’s plans to drill for gold north of Yellowstone. The company has also hired Noelle Laury, a Boise-based public relations contractor. Among mining opponents, who span the gamut from environmentalists and conservationists to local business owners who fear any mining would be detrimental to the seasonal tourist trade, the company’s efforts are less than welcome. For her part, Laury says the company is not planning an open pit mine, which is the going concern for many opponents. Further, she points out not everyone in the Paradise Valley is opposed to the mine. The Chronicle reports Laury will be hosting an informational dinner for mining fans at an undetermined date. Laury also points out that Lucky Minerals Inc. has a local subsidiary with a Livingston mailing address as well as an office in Missoula. Lucky Minerals Inc. is based in Vancouver, Canada. Nonetheless, Laury also admits that this kind outreach probably should have started when Lucky Minerals first approached the state about drilling two years ago. Currently, Lucky Minerals is looking to perform exploratory drilling on private land near Emigrant Gulch. This summer, the Montana Department of Environmental Quality gave the company the green light to do said drilling. We further reported that the company could start drilling by the end of this year. The Montana DEQ also issued Lucky Minerals an approximately $154,000 bond request this summer, which the agency says would cover reclamation costs should the company not find enough gold to pursue a larger project. The company balked at the bond amount, saying it was five times higher than necessary. Mining opponents railed against the bond request as being too lenient. The Chronicle reports the company has yet to put up the bond, although they’ve spent around $500,000 so far on the project. Despite the suit, though, Lucky is preparing to drill next summer. Shaun Dykes, the company’s vice president, said studies of wildlife and water quality have begun on the property, an effort to establish baseline data for the project. The company has also paid for an aerial survey to map important geological features in the area. New executives are now listed on the company website alongside Dykes, who has been the de facto face of the company since it proposed the exploration project. Dykes said they’re all skilled mining experts who can help the company raise the money they need for exploration — between $3 million and $5 million for this phase. He said they haven’t secured any major investors yet. Beyond the Paradise Valley, the company is also facing opposition at the federal level. 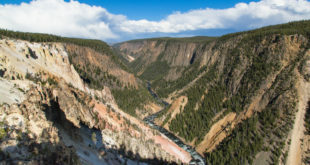 November 2016, then-Secretary of the Interior Sally Jewell placed a temporary moratorium on new mining claims in 30,000 acres of U.S. Forest Service land adjacent to the Lucky Minerals site. Opponents argue any company looking to mine gold would need to expand onto this land in order for mining to be profitable. Further, current Interior Secretary Ryan Zinke has said he wants to see a longer ban on mining claims in the Paradise Valley, pushing for the Forest Service and BLM to expedite their analysis of a potential ban.